Customers that sign-up for a paid subscription during the Cyber Monday Sale, can receive 20% off their subscription for 12 months. Between Monday November 26 - Monday December 3 2018, Kalix is holding a sale for Cyber Monday. Customers that sign-up for a paid subscription (monthly or annual) during this time, have the opportunity to receive 20% off their Kalix subscription for 12 months. To claim, use the coupon code: cybermonday on the Kalix Payments page, before you enter your credit card details. This is for new customers only. Everyone who registers for Kalix, receives a free, no obligation one-month trial (no credit card details required). Trial accounts gain instant access to the full version of Kalix. People who have previously registered for a Kalix trial, are able to contact us to restart their 1 month trial support@kalixhealth.com. As mentioned above, to redeem the Cyber Monday discount, customers must sign-up for a paid subscription (monthly or annual) between Monday November 26 - Monday December 3 2018. If your 1 month trial does not end during this period, you are still able to register for a paid account. After subscribing, you will keep the time remaining on your trial with your first payment not be due until your trial period has ended. During the trial period, you can also still cancel anytime and never be charged for Kalix. 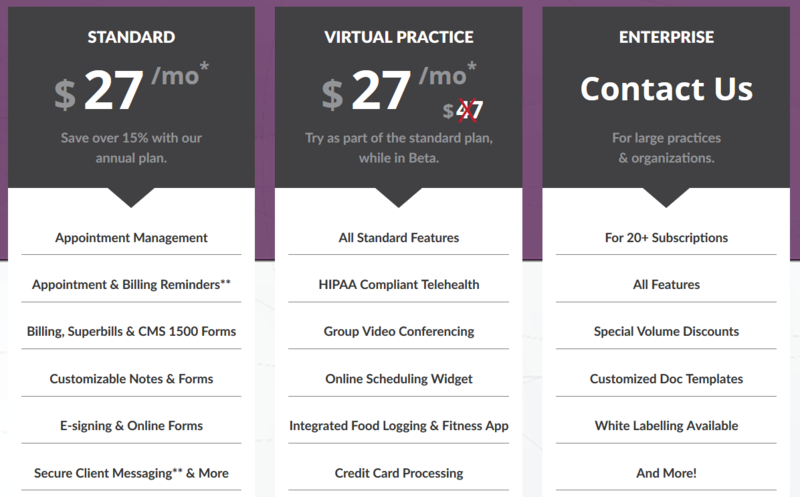 Virtual Practice Package - all standard features + telehealth (individual & group appointments) + online scheduling + online & in-person payments + integrated food logging and fitness app. Note: We are currently offering the virtual practice package to all customers at the discounted rate of $27/month or $270/year**. This discount will finish at the end of 2018. The Virtual Practice package will then move to its full price of $47 a month (monthly subscription) or $ 470 a year (annual subscription). *May require the additional purchase of messaging credit. Option to purchase dedicated numbers. **Per full-time equivalent practitioners (25 hours of appointments/wk). As an extra bonus, those sign up to an annual (or yearly) plan, will receive the Kalix's Virtual Practice package for one year at $216 ($270 + 20% off). Please note: purchases are final. Kalix does not offer offer partial refunds. If you cancel during your trial period, however, Kalix will not change you. After the discount period is over, your Kalix subscription will become the regular price ($270 a year for Standard Package or $470 a year for Virtual Package). Your subscription will also automatically renew at the end of 12 month period. Cancel anytime and never be charged again. 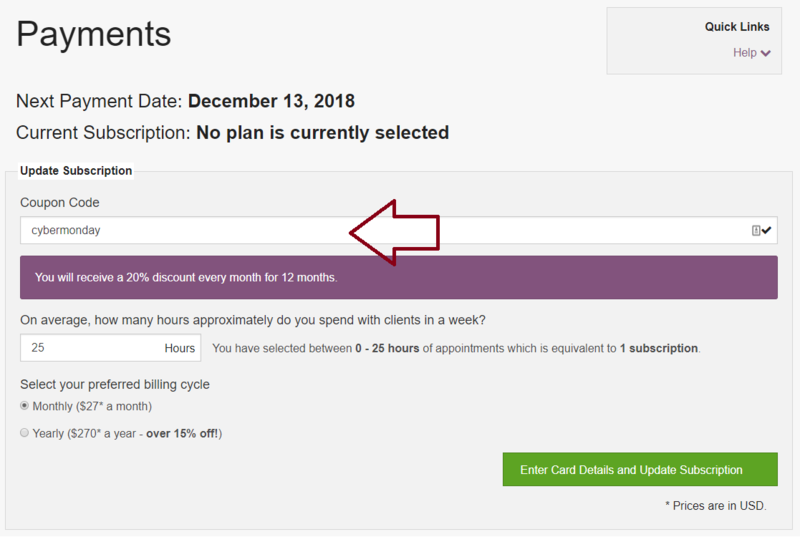 If selecting a monthly subscription, you will receive the Virtual Practice package automatically for your first 6 months of the discount period, at its reduced price (plus the the Cyber Monday discount) of $21.60 a month ($27 a month + 20% off). After 6 months you will have the choice to either downgrade to the Standard package and continue paying $21.60 a month for the remaining 6 months or stay using the Virtual Practice and pay $37.60/month for the remaining 6 months ($47 a month + 20% off). Please note: you can cancel your monthly subscription to Kalix at any time and will not be charged again. To receive the Cyber Monday discount you must sign-up to a paid Kalix account between Monday November 26 - Monday December 3 2018 via the Payments page. To access the Payments page, you must have first registered for a login to Kalix as part of a 1 month trial, learn more. When subscribing for the first time, we will only charge your credit card at the end of your trial period. e.g. you subscribe with 28 days remaining on your trial account, we will not charge your credit card until 28 days later. You can view your next payment date in the top of the Payments Page (as shown below). Enter the coupon code: cybermonday, before you enter your credit card details. When a payment is processed, we will send a tax receipt to your email address. Note: Transactions may take 48 hours to process. Please click on the button below for additional information about registering for a Paid Kalix subscription. Navigate to Kalix's Payments page. After entering the coupon code, choose your subscription number, package and payment plan, enter your billing information into our highly secure payment gateway. Pay Annually in advance for the entire year, for extra savings. Your subscription will be automatically renewed after the 12 months are up. Cancel at anytime and you will not be charged again. We also offer you the ability to purchase your own unique fax, SMS and text-to-voice number. Alternatively, port your existing number to Kalix (continental United States only). By using a dedicated number, you will be able to receive faxes, SMS and text-to-voice messages from anyone. Dedicated numbers costs are added to your monthly or annual subscription as an ongoing payment. Click here for pricing.